Singapore, Sep 27, 2018 — ASUS today announced that the RT-AX88U Wi-Fi router will soon be available. Featuring the latest 802.11ax Wi-Fi standard, which includes a variety of new technologies that improve Wi-Fi speed and network capacity, RT-AX88U enables users to get cutting-edge, future-proof performance from their home Wi-Fi network. In addition to the latest Wi-Fi technologies, RT-AX88U features a powerful 64-bit 1.8GHz quad-core processor to ensure smooth and responsive performance as well as two USB ports and eight Gigabit LAN parts to provide users the flexibility to expand and configure their network the way they want. RT-AX88U also features powerful built-in software, including adaptive QoS and Gamers Private Network (GPN) powered by wtfast® to accelerate online gaming, AiMesh for creating a whole-home mesh Wi-Fi system simply by adding compatible routers, and AiProtection Pro, commercial-grade network security powered by TrendMicro to keep users and all their connected devices safe from online threats. Many households and small businesses upgrade their Wi-Fi router infrequently, so current purchasing decisions can affect network performance for years to come. By upgrading to a new Wi-Fi router, such as RT-AX88U, when a new network standard becomes available, users can maximize network performance now and get the longest lifespan out of their Wi-Fi network. 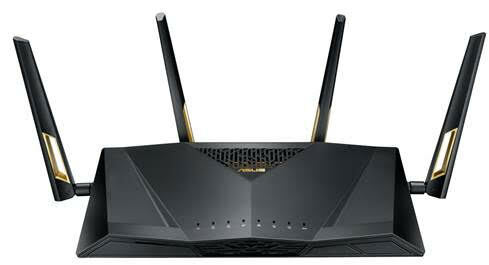 With the latest 802.11ax Wi-Fi, ASUS RT-AX88U supports 160MHz bandwidth and 1024-QAM to provide ultrafast Wi-Fi speeds of up 6000Mbps — 1148Mbps on the 2.4GHz band and 4804Mbps on the 5GHz band — 2.3X faster than 802.11ac 4×4 dual-band routers. In addition to boosting Wi-Fi speeds, the 802.11ax standard offers a number of other improvements and optimizations that address the massive increase in the number of connected devices in recent years. RT-AX88U features a revolutionary combination of OFDMA and MU-MIMO technology that provides up to 4X better network efficiency and capacity. With OFDMA, the data channel is separated into smaller sub channels, so data from different devices can be bundled together to ensure no bandwidth is wasted. This means that one channel can transmit data to several devices at the same time, improving efficiency and reducing latency. These smaller sub channels also enable RT-AX88U to provide up to 80% greater coverage than previous-generation routers. The 802.11ax Wi-Fi standard also helps to improve battery life of connected devices. A new technology called Target Wait Time (TWT) allows transmissions to be scheduled, so connected devices can sleep for longer periods, delivering up to 7X better battery life. ASUS RT-AX88U comes with eight Gigabit LAN ports to provide maximum flexibility for users who need or prefer wired connections. Additionally, two USB ports enable connection of an external hard drive or printer to create network storage or wireless backups and printing. One of the USB ports is located on the front of the router for easier connectivity. To handle the data from the increased number of connected devices supported by 802.11ax as well as from the eight LAN ports and two USB ports, RT-AX88U comes with a 64-bit 1.8GHz quad-core CPU that provides enough processing power to keep even the busiest networks running smoothly. ASUS RT-AX88U gives online gaming a double boost with adaptive QoS that prioritizes game packets within the network for smoother online play. Additionally, wtfast® finds the shortest possible path between the gaming device and the game server, minimizing ping time and packet loss. Support for ASUS AiMesh allows users to create a mesh Wi-Fi system by connecting other supported AiMesh routers to their network, letting them enjoy whole-home coverage with seamless roaming, synchronize features and centralized control. RT-AX88U provides lifetime free AiProtection Pro – commercial grade network security powered by Trend Micro that protects all connected devices within the network, even those that cannot run security software, such as IoT devices. AiProtection Pro regularly auto-updates its security signatures from the Trend Micro database to ensure network security is always up to date. Wi-Fi Network standards: IEEE 802.11a/b/g/n/ac/ax, IPv4, IPv6. Features Link Aggregation, Smart Connect, IPTV support, Roaming Assist, Dual WAN.